A Whole New Way to Look at Butternut Squash! Lately I have been into winter squash. Especially pumpkin and as of late, butternut squash. When most people think of butternut squash they usually think of a sweet dish that's made with sugar and spices like cinnamon and nutmeg. For me, I prefer sweetened squash as a dessert not as a meal. 1/4 cup butter, don't substitute here it really makes the whole dish work! Preheat to 375 degrees F. and adjust the rack to the center of the oven. Toss leeks, olive oil and salt and pepper in a bowl. Place leeks on a foil lined bake sheet and bake for about 15 minutes until softened and lightly browned, stirring half way through. Set aside. Set a steamer basket in a large pot and fill with a small amount of water making sure not to touch the bottom of the basket. Add the squash and steam over medium high heat until the squash is very tender, about 20 minutes*. Add 1/2 teaspoon salt, dash of pepper, 1/4 teaspoon of nutmeg and ricotta cheese. Transfer the squash mixture to a food processor (let cool slightly) and blend until smooth and creamy or use a hand held blender and blend right in the same pan. Add the butter and garlic to a large saucepan over low heat. Cook for about 3 minutes until garlic is very fragrant. Add the flour and whisk for 1 minute. Gradually whisk in the creamer/milk, turn the heat up to medium/high and continue whisking until smooth and mixture comes to a boil. Continue whisking, reduce the heat to medium/low and allow the sauce to simmer and slightly thicken, about 5 minutes. Season with 3/4 teaspoon salt, dash of pepper and pinch of nutmeg. Strain out garlic and set aside. Spray a 13 by 9 by 2-inch glass baking dish with cooking spray. Spread 3/4 cup of the sauce on the bottom of the baking dish. Place 3 1/2 lasagna noodles on the bottom of the pan. Spread 1/3 of the squash mixture over the lasagna noodles. Spread 1/3 of the pesto over the squash mixture and sprinkle 1/3 of the leeks over the top. Add 1/4 cup of the shredded cheese and 1/4 cup of the parmesan cheese. Drizzle 1/2 cup of sauce over the top and arrange the next layer of noodles. Add another 1/3 of the squash mixture, 1/3 of the pesto, 1/3 of the leeks and 1/4 of each cheese. Add 1/2 cup of the sauce over the top of the noodles and repeat layering 1 more time. Top the last layer of noodles with the remaining sauce, 1/2 cup of shredded cheese and 1/2 cup of parmesan. Cover the baking dish with foil and bake for 40 minutes. Remove the foil and continue baking until the sauce bubbles and the top is browned, about 15-20 minutes longer. Let the lasagna rest for 20-30 minutes before serving. *You could also roast the butternut squash along with the leeks/onions, just add 1 tablespoon of olive oil, a bit more sea salt and pepper and bake; mix a few times until soft and light brown, approx. 45 minutes. Great, hearty way to enjoy delectable squash! 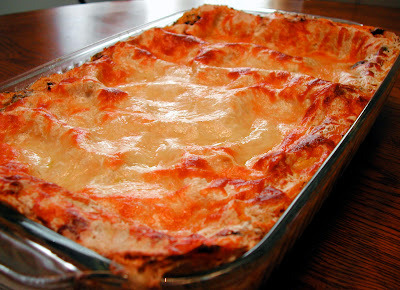 I LOVE butternut squash, I made an acorn squash lasagna a while back with good results! I am loving squash too! Looks great and the apples below are making my mouth water! This looks mouthwatering good. 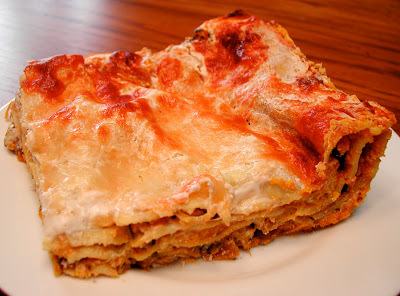 I have been thinking about butternut squash lasagna and how wonderful it would taste. Yours looks delish! Thanks for the comment! Yup, back in the blogosphere with nothing but time on my hands since my "baby" went off to college. This empty nest thing is a bummer. This sounds SO GOOD! I'm definitely going to try it. I made a butternut squash lasagna a few years back but the recipe called for condensed milk and the sauce took forever to thicken and wasnt really worth it. It was also missing ricotta cheese which to me, is essential in a lasagna. i am going to make this! thanks so much for sharing, it sounds delicious. This sounds absolutely wonderful! I'm bookmarking this recipe.. I haven't used butternut in lasagna before.. Great Idea! First time visitor and your lasagna looks wonderful....bodes well!